GWS v Port Adelaide at Manuka Oval – Magic Happens. For the fourth time this year Port Adelaide is getting on a plane, this time to our nation’s capital. The good thing about playing in Canberra is it is less than a three hour drive from my home. On the down side it is usually ten degrees cooler than Sydney. So I pack my teal, black and white beanie, my scarf, refuel the car and start the long hike down the Hume Highway. I’m travelling with my wife, Daria, and friend Tim Harcourt, aka the Airport Economist. Daria and I have been to games at Manuka Oval before but this is Tim’s first game there. Tim says he’s keen to go see a GWS game in Canberra despite being opposed to capital punishment. It has been twenty nine years since I first set foot in Canberra, and that was to play for Adelaide University in the Intervarsity Football Carnival. As a starry eyed first year player for the Blacks I had little idea of what to expect. All the teams had assembled at ANU Oval for the pre tournament barbeque, that was, all the teams except for Sydney Uni. The president of ANU delayed his opening address for as long as he could and just as he was about to start the Sydney Uni bus rolled in. In a scene reminiscent to the antics in the movie ‘Animal House’, the Sydney Uni players filed out of the bus. Their tour organiser apologised profusely and explained that there was a bit of a delay in Goulbourn involving McDonalds, some stolen restaurant property and the police. The rest of the Sydney Uni players didn’t seem as remorseful and decided to interrupt the apology by chanting “We all agree, Andrew Earle is magic “. Whenever there was lull in night’s proceedings they would break the silence and sing the chant again. As we were playing Sydney Uni in the opening round a few of us made enquires as to who Andrew Earle was. They told us he was playing his second year of Aussie Rules and he was a gun midfielder averaging just under eight goals per game in the Sydney Football League. They informed us he had already been approached by St Kilda and Richmond and was awaiting further offers. We had a pretty strong team and were willing to see just how good Andrew Earle was before assigning him a hard tag. As the game progressed we realised he was, at best, a good average footballer. Although, there were some watching who may say calling him a good average footballer was an insult to good average footballers everywhere. Despite losing by thirty two goals the Sydney Uni players felt that if it wasn’t for the efforts of Andrew Earle they would have lost by fifty goals and therefore decided to chair him off the field whilst again singing “We all agree, Andrew Earle is magic”. Later during the week the Sydney Uni guys told us they stole Andrew Earle’s driver licence and other identifying documents and went to a Justice of the Peace and legally changed his name. As part of the name change obligations the next day in the Canberra Times the following advertisement was posted. I, Andrew Michael Earle of < address withheld> do hereby change my said name of Andrew Michael Earle to Magic Earle and authorise and request all persons to designate and address me by my name of Magic Earle as of today. At the post tournament dinner the president of the ANU Football Club got up to address the gathering. As he tapped the microphone and said “Hello” the Sydney Uni team interrupted by singing a song which had become familiar to us during the week. However they modified the words a bit and this time sang “We all agree, Magic Earle was Andrew”. After the tournament I had always felt that Sydney University was a great club and this was confirmed several years later when I played for them. There has always been an eclectic bunch of nutters who ran a very successful club, built on over one hundred years of traditon, success and outright silliness. However this story is about two other clubs striving for AFL greatness. This was the first meeting of GWS and Port Adelaide in Canberra. I’ve always enjoyed going to Manuka Oval. The surrounding area has quite a few good cafes and shops to visit before the game, while the oval itself has a few small grandstands and a large standing area. It kind of reminds me going to Norwood Oval. It’s almost like watching grassroots football. GWS won the toss and kicked to the Commission of Audit end. Port Adelaide is not wearing their white away jumper and seeing them in the black with the white ‘V’ reminds me of the Adelaide University blacks. Added to this the cold weather started to cut to the bone and memories of the 1985 Intervarsity carnival came flooding back. The crowd size was very similar to those which flocked to ANU Oval twenty nine years early. Tim suggested the crowd seemed fifteen percent lower than what the AFL had expected and it was probably due to cuts imposed by Sir Tony Abbott. GWS start the game well and half way through the first term they have set up a two goal lead. From this point on Port begin to dominate. Gray’s inside work is captivating and Polec and White’s outside run finishes off his hard work. Port end the term kicking the last four goals. The second term starts as the first finished with Port having all the running. Port kick the first three goals of the quarter before GWS finally reply. This makes seven unanswered goals to Port. One of Daria’s favourite statistics is that when a team kicks six unanswered goals they are a ninety eight percent chance of winning. She starts to read her book. At half time Daria points out the fact that Port had kicked five goals and three behinds in both terms. The last quarter is not too dissimilar to the third. Ebert and Boak are having quiet games but this countered by Robbie Gray having a day out. When Gray isn’t setting up the outside runners he is finding space and moving the ball quickly. With a few minutes to play Daria informs us that Port have kicked four goals and three behinds and need one more goals to get the perfect symmetrical score. At this stage we are want one more goal and that’s it. There is a scrimmage at the top of Port’s goal square where Wingard grabs the ball and snaps for goal. It seems as if it is going to go through for a behind but we start cheering as it goes out on the full. A minute later Schulz marks in the square to make in five goals three behinds for the term. Inexplicably I now find myself hoping Port doesn’t score again. The ball goes deep into Port’s attack two more times and we find ourselves cheering loudly for GWS’s defence to clear the ball. Port ends the game with a thirty five point victory but more importantly they managed to score the same amount of goals and behinds in every quarter. I check out the history books and find out this has only happened once before in VFL/AFL history. That was way back in round eight of 1934 when Collingwood managed to kick three goals and three behinds in all four quarters to beat St Kilda by nine points. I have seen GWS several times and this time they were quite impressive. Except for fifteen to twenty minutes late in the first and early in the second quarters they matched Port Adelaide goal for goal. They are not far away from being a one hundred and twenty minute team and joining Gold Coast in the top eight. They probably need another good tall defender, a really dangerous small forward and a fit Shane Mumford and then they would start to cause a few headaches. On the drive home I kept singing a song to myself in my head. I would sing “We all agree, Robbie Gray is magic” again and again. I’m glad Port is still equal top of the ladder but there is still much to do before the club returns to the status it desires. I just hope the players realise that in order to make Port Adelaide a great club again they now have to steal Robbie Gray’s identity papers and change his name by deed poll to “Magic Gray”. Otherwise a football trip to Canberra will never be complete. Tim, That’s not too hard as there’s only Jesper Feldstad as competition. Ah the great Magic Earle – long time since I have heard that name. Every footy club needs a legendary figure either a player or official. At least you got to watch a game in Canberra at 2-10pm. When I watched North played Port there it was 11-40am bounce down and about 6 degrees. Top stuff Handbag, plenty of Blacks followups too. Rulebook should have bought the super iPad, more absorbent than the regular. Great read – first time I’ve heard the Magic Earle story. The Blacks never disappoint. I hope your stats are accurate Dan as there is plenty of info here for this weeks quiz, a great read. I recall being assigned Magic Earle in an offensive-tagging role in the first game of said carnival. Wobbly does not describe the half of it…I can only recall being more nervous going for a mark with Keith Kuhlmann bearing down upon me. 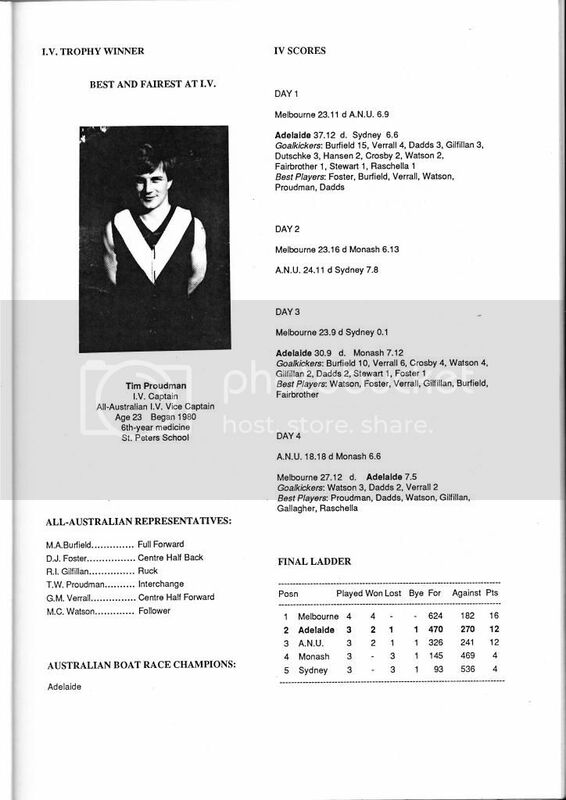 I also note Danny’s family-friendly recall of the Sydney Uni boy’s arrival (elliptically referred to in RuleBook’s post)…suffice it to say they had a novel way of declaring the IV open that was unlikely to be welcomed by the umpire bouncing the ball at the start of the first game early the next morning. Someone must have kicked a few that day? Runners up to Melb Uni but a great trip! Rulebook, the famous Magic Earle advertisement in the paper can be seen here. Andrew Earl is Magic / Magic Earl was Andrew – genius! Nice combination of the past with the present Danny. Sorry to have missed you and Plug in Canberra, I was busy in Adelaide coaxing the Demons home against the Crows. Great statistical symmetry by Port Adelaide in one of the coldest Canberra games. The 1980s IVs were truly spectacular, Magic, Micky and Bob the absolute stars. Gteat stuff Valdemeer. It was a long time ago but I think the real reason we smashed Sydney was because Rulebook dominated – can I go now Book? Enjoyable read. Woudl have liked to see the dream matchup Bob Neil and Magic Earle. I hear that Jeremy Cameron holds the pre-game record of eight cans between Sydney and Canberra. And Goulburn is known as bowel-movement city. Commission of Audit end – where the goalposts keep moving. Was Commission of Audit member and Port Director A. Vanstone in attendance? Great article … Both from a Blacks & Power perspective. Brings back Blacks memories of Hold your Bowlies … I managed to NEVER draw the raffle! Gold Danny, very nice segway into gratuitous walk down memory lane. Great stuff Danny! I cant believe that IV trip was 29 years ago… but then I cant recall much about this trip anyway that I will confess to without immunity. But you missed Magics most magic moment. Set the scene Adelaide had beaten monash and sydney. melb had beaten monash. But had to beat sydney in the last game to make the grand final against the mighty blacks. We had survived monash – i got in front of the pack 6 times see rulebook above but thats another story. Melb were on the field. But where were sydney. Approx 5 mins late they ran out wearing streamers where shorts were meant to be and surronded for a team huddle with magic as the centrepiece around the centrecircle. They chanted and sang and then broke up and put their shorts on and took up their positions. SOmehow in the centrecross of the centrecircle was a human turd. Noone removed it and the game was played which was duly won by the chief shitkickers melbourne uni. as you can see above they snuck over the line in the GF . Very entertaining, both the Magic Earle story and the comments that have followed. Brilliant stories, woven through an evocative match report. Great work Dan. Magic Neale immortalised by Deed Poll is priceless, and the turd in the centre square another one for posterity. It seems to be a tradition for Melbourne Uni to win these tournaments, after having taken everything a midge too seriously. Sure, they’ve had several carnivals more than their already ample share of success but at what cost? Curfews, drinking restrictions, actually having to turn up – these were the sort of things that the Blacks IV side would be travelling interstate to get away from. What good is an IV victory without the swashbuckling and glorious adventures that stood, often impassably, between you and it, I ask you? It should be remembered that uninterrupted success has a tendency to erode one’s sense of humour too. In Adelaide in 2002, Melbourne as usual were the team to beat. They arrived at games by team bus, intimidating physical specimens all, marshalled to warm up in their matching tracksuits by their coach, a serious chap with cropped white hair. He had a clipboard, and someone to hold it for him. If you are starting to get flashbacks of bad 1980s Cold War sports movies, you are not far from the atmosphere of terror that they carried about with them in their initials-embossed kit-bags. They actually selected a team for each match, with a handful of ’emergencies’ not required each game, and those selected to play had to be tucked up in bed by an appointed time. I knew this from a discussion we had one night with a lonely Melburnian who was only out past midnight, without the rest of his team-mates I add, because he was being rested the next day. We contrasted this with our irrepressible night-time antics and rather more abbreviated selection process, involving a head-count of those who were both present and conscious in the minutes before the first bounce, and thought, ‘How the hell are we going to beat these guys?’. And almost immediately after that, we thought, “We can’t!” and opened another beer. We hoped to meet Melbourne in the grand final to keep our hopes alive as long as possible, but drew them in the semis. We tried hard, but we were awfully outclassed, and awfully hungover. After the game we lined up across the ground to face the huddle of Melbourne boys warming down and belted out a rendition of the Uni Scum song while we danced the can-can. When we got to the song’s profane crescendo, for just a moment they didn’t get the joke. The coach’s eyes glared bright red, hammer-and-sickle at us, but fearing for our lives we can-canned on. They got it in the end. We fell about laughing with the release of tension, and the cheer we got from the UWA netball team in the grandstand beat any IV medal you could offer me. As it was, we ended up with bronze. Reading the posts brings back great memories of the two IVs I was fortunate enough to participate in – 91 at Flinders and 92 in Melbourne. 1. We beat Melbourne Uni in the Grand Final. Notwithstanding they were as Tommy Drugs Martin above (big and serious), Scot Schmidt the spy was on fire and kicked a bag and Jamie Roger Ramjet did the most amazing hip and shoulder (i heard the air leave the players body (and i was in the back pocket). It was a great result given we had been having fun with the Sydney boys the night before. 2. We inherited (possibly stole) Sydney Uni’s song and made it the Scum anthem. I understand it is still sung today. 92 was one of the greatest weeks of my life (my wife does not like me saying so). this was notwithstanding i popped my shoulder (yet again) the day before we left on the bus. We had some absolute legends on that trip that made it a ripper – the Jerk (his “choc chip” cookies on the way to Melbourne), T-Shirts Timmy Bryson (he had too many cookies and spend most of the bus trip with his head in a bucket), Clinton Rule (who was on the bus microphone most of the way to Melbourne), Dr Tim Kelly, Mark Washyn (he spent most of the trip playing up), Nelson Mandela (he showed me the best way to get to a bouncer (at the Metro in Bourke St), Bam Bam Kewell, the wedding cake (as he fell asleep on the phone to his fiance a can of shaving cream was used to cover his torso), The Verral Cat, Rulebook. The list goes on. Alas we smashed on the field but no one really cared. PPS – GWS Could have done with “another good tall defender” yesterday! This trip was ground breaking as revival of , IV after out trip to , Melb the year before when we thrashed , Melb and our b grade thumped , Monash . 40 guys in 8 rooms was not ideal but we expected some of the guys to engage females when they bought the girls back that created further problems . The arrival of Sydney Uni and the centre circle ritual to declare the games open was a highlight , after we thrashed , Sydney Uni they said they were really there to win the boat races. As I was renowned for my planning and strategies I came up with a plan that our team would keep off the beer and the boys not participating would buy the sydney guys beers. We also had a interchange system where by , Chocka did prelims and I did finals this worked well until the gf when there were numerous re runs how ever we won much to syd and melbs dismay . 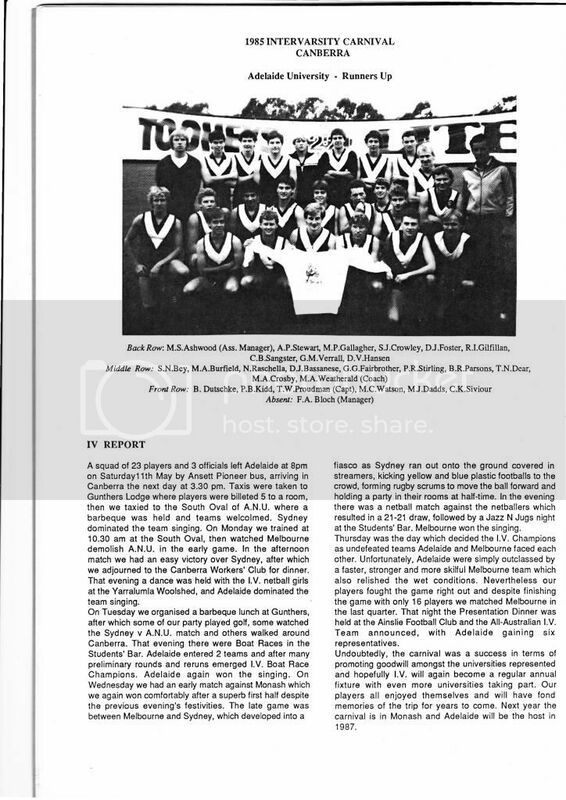 Melb Uni after winning the prelim games then flew in 10 fresh new players for the gf as comments above we just lost . I also did a deal for whole group of cheap meals at the rsl club as I said to them give them cheap food and they will give you a good profit re grog . When I went to pay first night they said free for you provided you get other sides to come so while they payed we ate free . Another memory is when , Chocka and myself were approached by some women from a netball side looking for a couple of our players why we asked because they had taken some of our players to the most expensive restaurant in , Canberra and when coffees were ordered they went to the toilet never to return leaving the girls to pay . Hope this may revive some great memories of this trip for thoss who went and the great experience of IV in general ! what book did Daria take to the footy? a novel? a stats text book? It was a e-book, on her Smart phone. She was reading Bonkers by Jennifer Saunders. I’ve tried to get her to read Mongrels I’ve Met by Mal Brown but she’s simply not interested. Magic Gray – Norm Smith 2014!